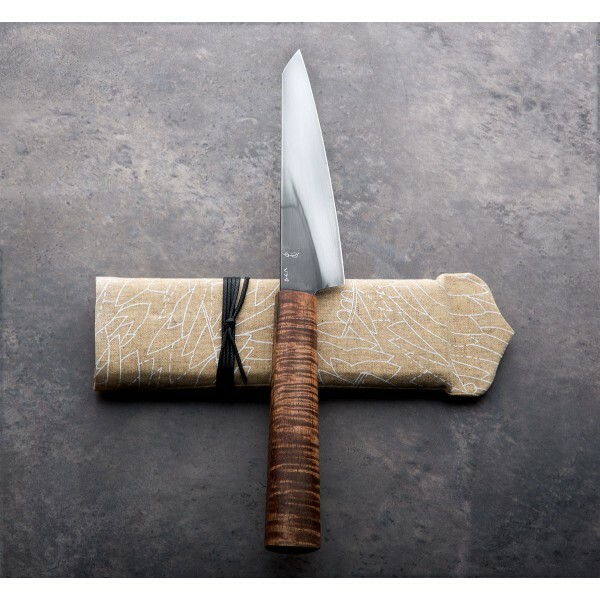 At 5" (127mm) this handmade petty chef knife with differentially heat treated 1095 blade has Don Carlos Andrade's typically outstanding convex geometry and edge performance, inspired by his years in the kitchen. 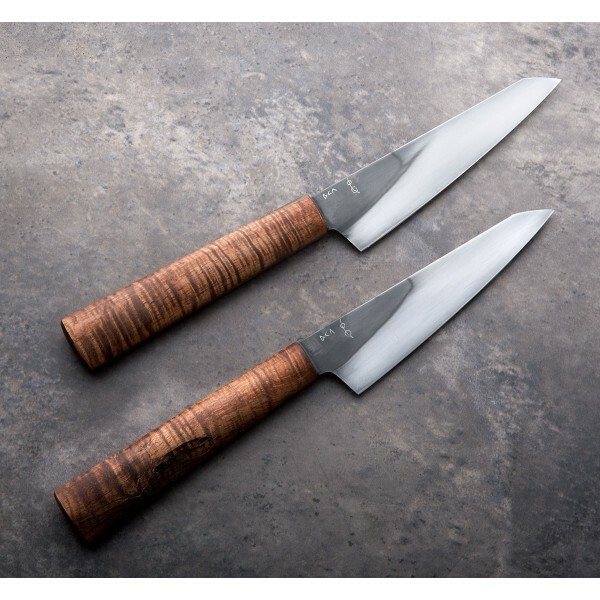 Dressed in gorgeous koa wood with simple, pin-less partial tang construction it is a simple, comfortable and versatile mid-size utility blade for the kitchen that will last generations. A handmade cloth-covered protective case is included. 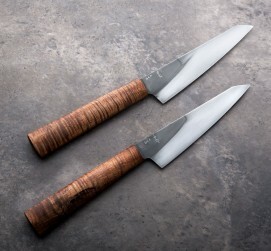 *The knife pictured on the bottom in the main photo that shows two knives is the knife you will receive. If you have any questions please let us know. 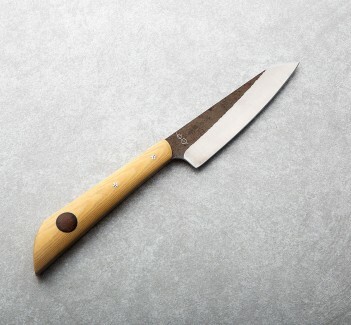 With its beautiful, polished finish this petty chef profile represents an excellent way to experience Don Carlos Andrade's deep understanding of culinary knife geometry at an attainable price point, in a size that will stand up to nearly any task. 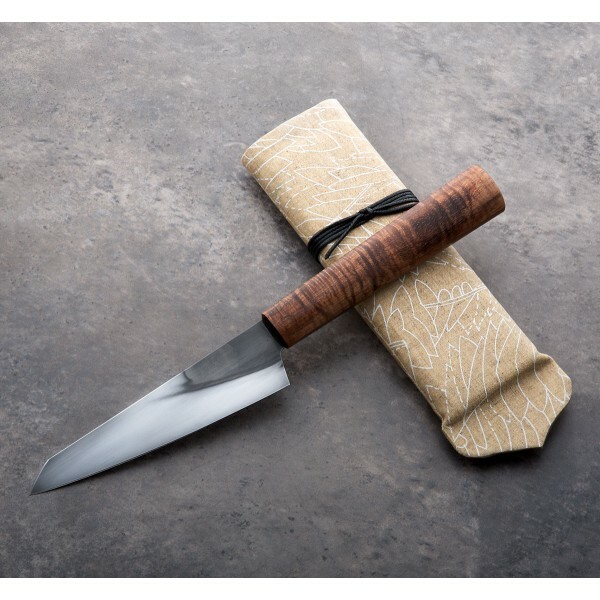 The gently curved edges rocks beautifully on the cutting board and can be used for both handheld work as well as chopping, slicing and dicing tasks. 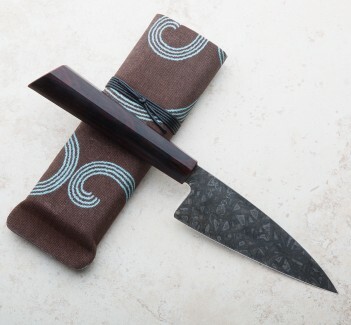 Blade length: 127mm / 5".  Overall length: 10.125". Blade width 1" in front of heel: 2mm. Blade height at heel: 32mm. Weight: 3.1oz / 88. 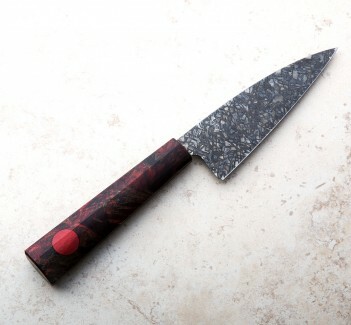 1095 carbon steel blade, polished and etched. Koa wood handle. The knife has in fact arrived and is truly a thing of beauty. Couldn't be more satisfied thus far. Thanks so much.